This summer, for the first time, BBC Sport has broadcast live commentary on every day's play of every match in the county season. Broadcasters have watched thousands of runs scored and hundreds of wickets taken in a season which has seen Durham win the County Championship for the third time in six years, Northants lift the FLt20 trophy for the first time and Nottinghamshire triumph at Lord's in the YB40 final. 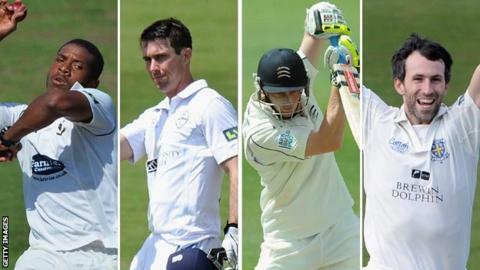 We asked BBC local radio commentators to nominate players for the 2013 county Team of the Season. Ed Joyce, Samit Patel, Michael Klinger, Scott Borthwick, James Foster, Alan Richardson, Kyle Hogg, Glen Chapple, Michael Hogan and Simon Kerrigan were among those unlucky to miss out after enjoying excellent summers, but here is the final XI. "Varun Chopra's ability to make big runs at the top of the innings has again been crucial for Warwickshire. "He reached 1,000 Championship runs for the third summer running and spent the latter part of the season as acting captain for the injured Jim Troughton. "Chopra's highlight was his ultimately match-winning 226 not out against Middlesex at Uxbridge when he showed admirable selflessness by declaring just short of his career-best score. "Unfortunately, he didn't make the best of his England Lions opportunity, but this winter's tour provides him with a fresh chance." "Sam Robson's reputation as an opening batsman around the county circuit has been growing for a while, but this was the season that he announced himself to a wider audience. "He looked certain to be the first to 1,000 Championship runs, but a slow middle of the season allowed Wayne Madsen to pip him to the landmark in a match which saw Middlesex put Derbyshire in to bat. "Robson's game is built on his resolute defence and his ability to leave the ball, but his timing is immaculate and, once in, he can dominate bowling attacks. "He now appears to have cleared the doubts over his international future by opting for England, his mother's native country, rather than Australia, the land of his birth." "To be the first to reach 1,000 Championship runs is no mean feat. "To do it in a struggling side, and to be the captain of that team, makes it an even more remarkable achievement. "Composed as a captain, who is unquestioningly followed by the players at his side, Madsen also has a knack of taking wickets at crucial times and is an outstanding fielder - in short, he is a pretty decent cricketer. "Add in his international hockey background, accounting for his wristy strokeplay, and a demeanour that exudes good manners and patience in equal measures, and you have some sportsman." "Moeen Ali finally came of age in 2013 after two summers of comparative underachievement. "It looked as if the stylish, young Birmingham-born batsman had made the big career breakthrough when he passed 1,000 runs for the first time in 2010. "But the security of signing a five-year contract extension has now borne fruit for an entertainer capable of destroying any attack. "And he went into the final round of matches as the country's leading County Championship run-scorer with 1,331 runs at 66.55." "Gary Ballance has had a superb season in all forms of the game and has been given his reward with a place in England's squad for the winter Ashes tour. "He has a solid defensive technique but is at his best when attacking, and the Yorkshire staff believe he is one of hardest hitters of a cricket ball in the team. "Before the final Championship game, he had scored 995 runs at an average of 52, as well as 426 runs in the YB40 (average 60) and 269 in the FLt20. He is a real entertainer and an excellent fielder as well, which helps these days. "Whether he makes the Test side in Australia remains to be seen, but one thing is sure, he will not let England down." "Steven Davies has been exceptional behind the stumps this summer. "In the Championship he has always looked in good form with the bat and although he will look to convert more starts into big scores next season, he showed during his century against Warwickshire that he is lovely to watch when he is in full flow. "In limited-overs cricket, he is a game changer on his day and his hundred against Hampshire in the opening game of the YB40 and 95 not out against Kent in the FLt20 showed what he is all about." "David Willey's all-round contribution to Northamptonshire's fortunes is one of the chief reasons why they have competed strongly in all three competitions this summer. "He caught the eye on T20 finals day with a 19-ball half century, a run out, a catch and a hat-trick to wrap up the club's first major trophy in 21 years, but Willey has also been consistent in the four-day game with nearly 50 first-class wickets and three fifties. "The biggest improvement in his batting as he now plays each ball on its merits, rather than trying to crash it to the boundaries. His bowling is handy but if international ambitions are to be fulfilled, more work is required. "His sense of fun has also stood out on the field - and off it, with his often entertaining tendency in press conferences to speak his mind. Northants are delighted to have seen him sign a new three-year contract." "I first met Chris Jordan on the Sussex press day, a freezing April morning with a hint of snow in the air. "Despite the weather, he couldn't wait for the season to start and gave the impression of a very determined cricketer who had a point to prove, so much so that I immediately decided he would be my 'player to watch' in 2013. "Ahead of the final round of Championship games, his 52 wickets have elevated him to the top five wicket-takers in Division One, a top score of 92 shows he can bat, and with 20 catches he is one of the best slip fielders around. "Surrey's loss is Sussex's gain. He has more than proved a point to his former club, and more international honours beckon after his inclusion in England's winter Performance Programme squad." "Jeetan Patel's fall from grace with the New Zealand selectors has worked out nicely for Warwickshire. "After a series of mishaps with overseas players in recent years the Bears have found Patel a stabilising influence over the past two seasons. "The off-spinner's performances have been consistent and he has reached 50 Championship wickets in both campaigns. At times, he has also contributed significantly with the bat this summer. "A popular, enthusiastic member of the squad, his presence has been crucial in a season when Warwickshire have endured so many absentees among their senior players and they wasted little time in signing him for 2014." "Durham were tipped for relegation by so many cricket writers and have proved them all wrong by winning the title. "Scott Borthwick has been terrific following his move up the batting order, Mark Stoneman continues to prosper as an opener in both one-day and four-day cricket and I am struggling to think of a better all-rounder at the moment than Ben Stokes. "However, Durham's key performer has been Graham Onions, who has had to put up with an awful lot of disappointment from England, but has come back time and time again and continued to take the wickets in bundles. "He has 60 plus this season so far, the fifth time he has taken more than 50 in a season. You always feel when he has the new ball in his hand the wickets are not far away, as many a team will testify." "Steve Magoffin must be a captain's dream - throw him the ball and you know exactly what to expect. "He is the perfect partner for Chris Jordan, he rarely gives the batsmen a ball to hit, builds pressure, but most importantly, takes wickets, lots of them - 61 before the last round of matches. "Nearly 30% of his overs bowled are maidens, not a bad achievement when you have bowled over 450 overs in the season, and all that with a knee complaint that needs careful management. "The Australians might have missed a trick overlooking Magoffin this summer, but Sussex will be delighted they did, and skipper Ed Joyce probably owes him a beer or two over the winter months."